My co-teacher and I decided to meet our third grade students with joy to find out who they are and what they care about as we set off to be a community together this year. This is not to say we should avoid the more painful conversations, or plaster over horrifying moments in our nation with superficial joy. However, we wanted to start all of our students off this year with empowerment; knowing their voices (and feelings, bodies, etc.) matter–and yes, we’ve got work to do. They took this on with fervor, and seemed to know that we could all use some inspirational monuments right now. We saw our new crew’s joy in their bustling backpacks bouncing up and down. We saw their joy as they saw a face they recognized, or not-so-coyly showed off a new haircut. We saw their joy in a high five with a staff member who was happy to see them. Look at the rules we have created together about how and who we aspire to be together in this room, choose one, and create a piece of art about it. What would you want something in a public space to stand for? Who brings inspiration to you? What value do you want everyone to see? I worried this open-ended project might be a huge ask to make of new third graders. Nevertheless, I wanted the students to decide what they stood for this year without our pushing or guidance. 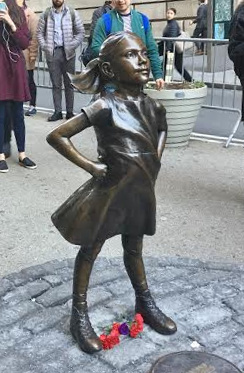 Even though I am a boy, I think I can also look just like the Fearless Girl. She looks brave! Murmurs of ideas began; some faces scrunched as they thought hard about what they would create, others reached for their new pencils. Best of all we saw the shining pride on the students’ faces as they worked hard to get this idea that was important to them across to their fellow classmates. We made a video with each student sharing what their monument was about. 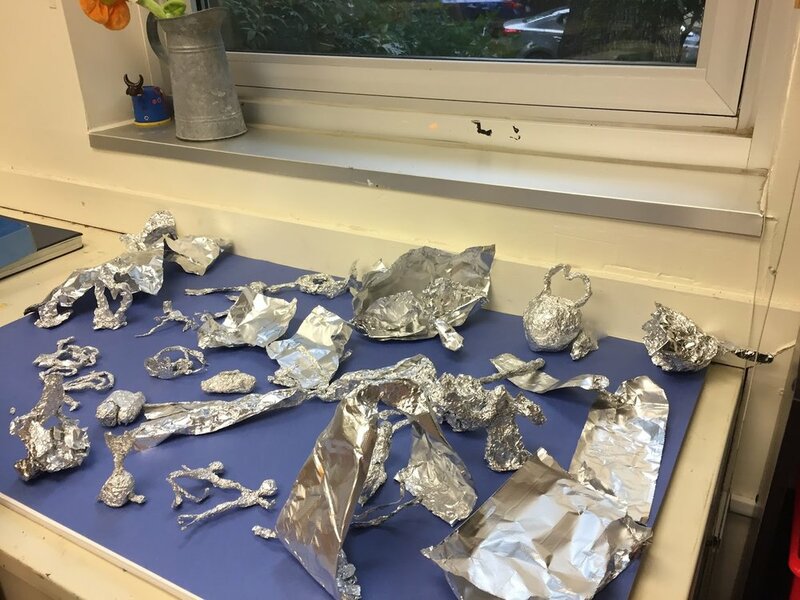 They might look like bizarre foil concoctions–but they are actually very detailed and full of meaning! We will continue to revisit conversations about our classroom rules, how we can use our monument’s ideas to respect one another, and how we can check that we stick to these agreements. We will also continue this conversation of monuments to investigate more painful ideas like ideas of hate, difference, and the complexities of our identities and feelings as the year goes on. But we chose to start our year full of pride in who we are and what we aspire to be. As we turned off the lights and left the classroom at the end of the day, we smiled. While there will be many tough days as we work to do anti-oppressive, anti-racist, anti-hate work together every day, it is heartening to know that this is the map of our classroom, and these are people and ideals that we will stand up for, and strive for, together. Gabby Arca is an elementary educator who is passionate about the brilliance of all young people, and the caring, justice oriented work they can do. She likes to play almost all games (especially with her 3rd graders), and is an avid eater and traveler, but a terrible chef. She writes and teaches about these passions with rad co-teacher Nina Sethi on their TeachPluralism blog. They wrote, Telling Truth: Why we teach storytelling to fifth graders for Brightreads.